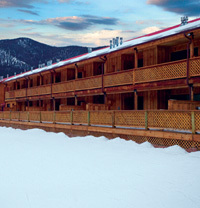 If you're looking for the convenience of ski-in/ski-out lodging, your WorldMark resort in Red River, New Mexico, may be just the ticket. Located at the base of the Red River Ski and Snowboard Area, your resort is just 30 feet away from the nearest ski lift and only three blocks from the ski area's main entrance. In addition to skiing, you can also partake in snowboarding, snowshoeing, or snowmobiling. While Red River (pop. 484) receives up to 188 inches of snow annually and is perfect for winter sports six months of the year, the area is also an ideal spot for other outdoor activities. Sunny 340 days a year, the resort invites you to spend the milder months hiking, biking, fishing, or horseback riding. A visit to Red River—located at the southernmost tip of the Rocky Mountains in northern New Mexico—is not complete without a visit to nearby Taos or traversing the Enchanted Circle Tour. This National Scenic Byway circles Wheeler Peak, the highest in New Mexico, at 13,161 feet. Don't miss stopping along the way to see the works of local woodworkers, tinsmiths, painters, stained glass workers, and sculptors. Located in the historic district just five blocks from Santa Fe Plaza, the city’s romantic heart, this future WorldMark Santa Fe resort is the perfect starting point for immersing yourself in the decades of art and culture that make the area so unique. 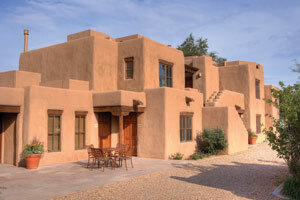 Pueblo architecture and the creations of skilled artisans transport you to another time and place — one that’s so fascinating, it might just make you hesitant to return home. WorldMark Santa Fe is a charming boutique-style resort that’s perfect for relaxing after a day of exploring the surrounding area. The warmth of the traditional Kiva fireplace contrasts with the modern entertainment of a flat-panel television, DVD and CD players in a most appealing way. Of course, you might just want to curl up in a blanket and lose yourself in a good book. Santa Fe is full of artists of all types, and you can view their creations and purchase unique keepsakes all over town. Start with Santa Fe Plaza, the famous square in the center of town where much of the magic happens. As you walk there from your resort, you’ll find a host of satisfying restaurants to choose from. Fine art galleries and museums abound, including the world-famous Georgia O'Keeffe Museum. Many churches and cathedrals are also popular attractions, including the Loretto Chapel and its spellbinding spiral staircase. English, Spanish, and Tewa—a Native American language—are spoken here. But the universal language in Taos is art. Taos, in north-central New Mexico, has been a thriving artists’ community since the early 20th century. One early artist in town was Nicolai Fechin, who passionately depicted the local landscape and Native Americans. 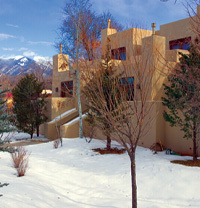 WorldMark Taos is built on the same property as his former home, which was originally built in 1927 and is now listed on the National Register of Historic Places. While art is pivotal to the area, don’t neglect Taos’ historical museums, interesting shops, and scrumptious barbecues and Tex-Mex cuisine. The area is also a recreational playground, where you can ski, snowboard, hike, bike, or kayak amid a landscape of expansive vistas, castles of clouds, and radiant red earth.